THE BRIGADE OF GURKHAS (BG) IS GROWING! With this will come increased opportunities for promotion and many new jobs for Gurkha soldiers in areas of the army not previously open to the BG. 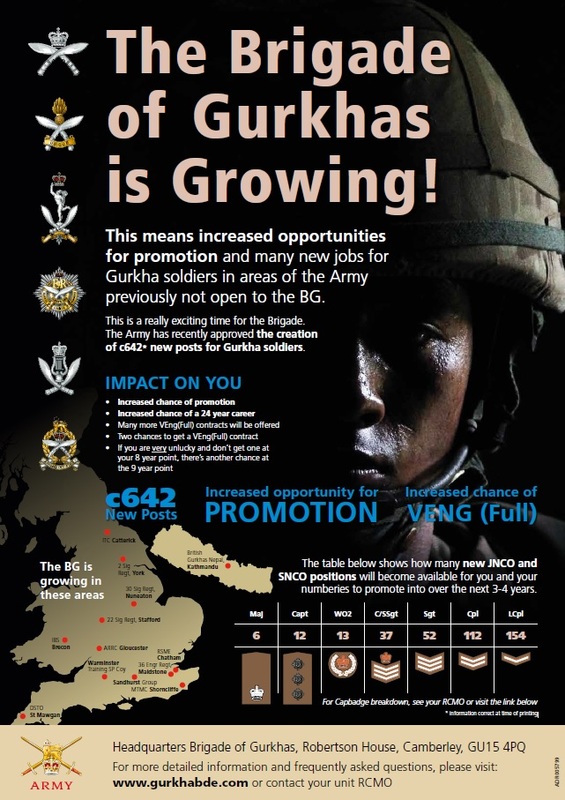 Over the next four years the Brigade of Gurkhas will grow by 642 posts, increasing from our current liability of 2,612 to 3,254 (correct at the time of writing). This growth will have a profound and positive impact on an individual Gurkha’s chance of securing a full career (VEng Full), increase promotion prospects and offer a variety of employment options previously unavailable. More information will be published over the course of next week and in the next issue of Parbate.